St John Bosco, who loved Christ in the Blessed Sacrament so deeply and spread that love to so many, help me to understand this mystery of God’s love for us that I too may find, in frequent attendance at Mass and Holy Communion and visits to the Blessed Sacrament comfort and strength throughout my life and at the hour of my death. Amen. GLORY BE to the Father, and to the Son, and to the Holy Spirit, as it was in the beginning, is now, and ever shall be; world without end. GOD OUR FATHER, IT WAS YOUR WILL THAT THROUGH THE INTERCESSION OF THE VIRGIN MARY, ST JOHN BOSCO SHOULD RAISE UP NEW FAMILIES IN THE CHURCH WHO WOULD WORK FOR THE SALVATION OF YOUNG PEOPLE; GRANT, WE PRAY YOU, THAT WE TOO, BURNING WITH THE SAME FIRE OF LOVE, MAY SEEK SOULS AND SERVE YOU ALONE. THROUGH CHRIST OUR LORD. St John Bosco, who had so enduring a love for Our Lady Help of Christians, ever your Mother and your Guide, help me to share this deep and lasting love for Mary. 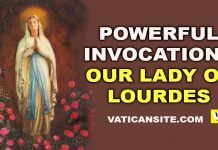 May I experience her powerful help and protection throughout my life and have her at my side at the hour of my death. Amen. 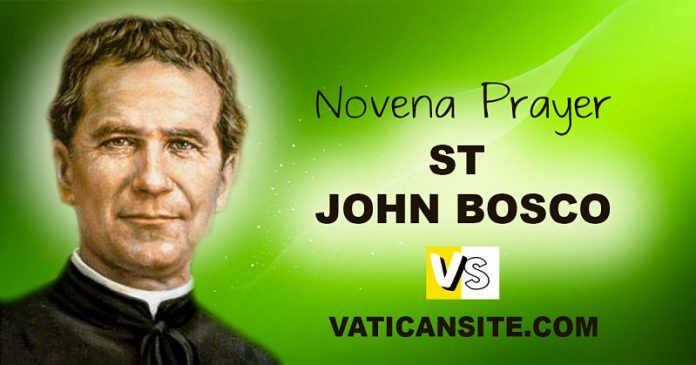 St John Bosco, you had a deep love for the Church and an unswerving loyalty to the Pope. 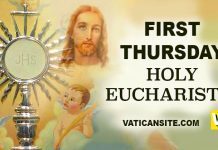 Help me to be a faithful member of the Catholic Church, proud of my faith and ever loyal and obedient to the Holy Father, the Vicar of Christ, and to the Bishops and priests who share his authority. Amen. St John Bosco, you had a generous and practical love for the young, for so many of whom you were Father and Guide, working for them with heroic sacrifice. Young people are especially dear to our Saviour. Help us, too, to work for them with a holy and generous love and to see in each one of them the person of the young Christ growing up in Nazareth. Amen. St John Bosco, you founded the Salesian Society and the Daughters of Mary Help of Christians to continue your work for youth. I pray that all these priests, brothers and sisters may be filled with your spirit, your zeal, your love and joy, and so inspire other young people to follow them. Amen. St John Bosco, in order to deepen Faith and Charity in the world, and spread your work for youth, you started a third family, the Salesian Cooperators. May they be strong, fervent, apostolic Christians, supporting your work, and spreading a love of Christ in their homes and among young people wherever they live. Amen. St John Bosco, whose zeal for the salvation of men could not be kept within narrow frontiers, you sent your Salesian sons and daughters to the end of the earth. From Heaven intercede for all missionaries that their work be blessed. Obtain for me a zeal like yours that in working with generosity and enthusiasm for the salvation of others, I may save my own soul. Amen. St John Bosco, by God’s grace you preserved within yourself an overwhelming love for purity and preached it by word and example. 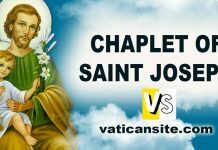 You led St Dominic Savio to holiness while he was still a schoolboy. Obtain for me the grace to be pure of heart and so through my own way of life let others see the joy of life in friendship with Christ. Amen. St John Bosco, you had a heart full of compassion when you saw people suffering or in need. Obtain for me, for my family and loved ones, the blessings of Our Lady Help of Christians and all the graces we need. Pray especially that our families may be united in peace and harmony in this life and be gathered together with you in the joy of praising God for ever in Heaven. Amen.